When my parents first met my husband to be, my mother was deeply upset to discover that her potential future son-in-law came with an accessory she did not care for – his ponytail. As long as I have known him FFOMC has had long hair and I absolutely love it. At one point he even had dreadlocks following one of our early holidays together to Morocco – on our return flight we were stopped at every single check point and he was all but strip searched. We were both a little emotional when the dreads had to be cut out, and my mother harboured a – not so secret – wish that he commit, on a long term basis, to a short back and sides. But after the trauma of the shortest hair cut he had in many years, his hair continued to grow and by the time of our wedding he could have taken work as a Kurt Cobain lookalike. 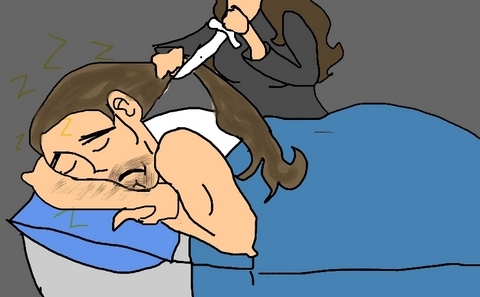 It is not the “done thing” in Northern Ireland for men to require a hairdresser to straighten their shoulder length hair on the morning of their wedding and my family were running a book on the likelihood of Mum sneaking into his room at night with a razor. He looked amazing on our wedding day so handsome. During the speeches FFOMC’s hair and goatee beard were mentioned by most speakers and my good friend got a fantastic laugh from all of our guests when he outlined the reasons that I was too good a catch for a mere mortal and was a worthy partner for a god – but at least I had married someone who looked like the son of God. I often wonder, if like Sampson, FFOMC’s strength lies in his manly locks. If he were to cut his mane I wonder if he would be less humorous, less attentive, less patient, or less loving. Clearly this is not a risk worth taking. So long live the ponytail!